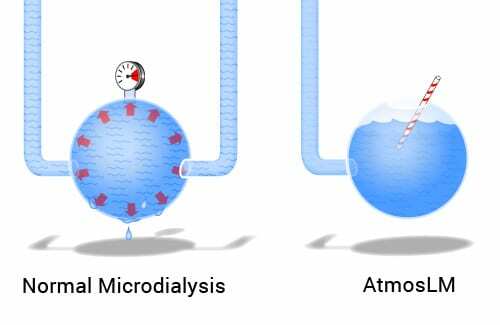 Pressure Canceling Microdialysis For the Recovery Of Large Molecules, Neuropeptides, Cytokines and Proteins. Polyethylene (PE) Membrane with 1,000 kDa Cut Off, 0.44 mm outer diameter. 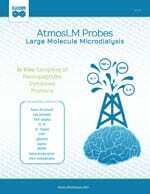 Aside from the Pressure Canceling Technology, the AtmosLM™ Microdialysis Probe, model PEP, is similar to our AZ microdialysis probes. We carry standard sizes of 4, 8 or 12 mm for the shaft length (X mm) and 1, 2, 3 or 4 mm for the membrane length (Y mm). Other sizes are available. To collect the sample from the probe, a “pull” pump is required in addition to the infusion syringe pump. Eicom has developed a new peristaltic pump, the ERP-10, specifically for the AtmosLM™ system. The ERP-10 completes the AtmosLM™ system offered by Eicom, an incredibly convenient large molecule sampling system. The tubing from the syringe pump to the PEP-probes should be 0.1 mm ID (JT-10 or WT-35). The tubing from the PEP probe to the ERP-10 should be 0.25 mm ID (JF-10 or WT-35). The WT-35 has two tubes covered by a protective sheath. One tube is 0.1 mm ID (inlet) and the second is 0.25 mm ID (outlet). Please download the manual for more details. The FC-90 fraction collector provides refrigerated fraction collection from up to four probes simultaneously. The samples are stored in a 96 well plate with resealing plate seals to prevent evaporation and cross contamination of samples. The RCS-91 rotating cage stage and balance arm obviates the need for swivels: when the animal rotates, the stage rotates in the opposite direction to eliminate twisting in the animal’s tether. 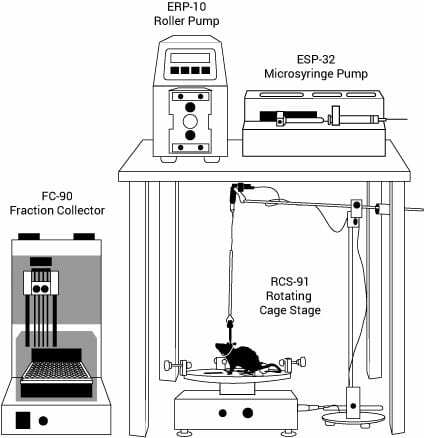 The RCS-91 also obviates the need for electrical and optical sliprings, making it much easier to combine microdialysis, electrophysiology, and optogenetic equipment in the same experiment.